These white chocolate cupcakes are filled with cranberry curd and frosted with white chocolate buttercream. For a festive finishing touch, top them with white sugar pearls and sugared cranberries. Happy December! Just in case I needed a reminder that winter is upon us, I caught my first bug of the season last week. I’ve already been sick for eight days straight, and I’m still trying to recover fully! This thing is really seeming to hang on forever. As timing would have it, I was in the middle of baking a batch of these cranberry and white chocolate cupcakes when I started feeling sick. I didn’t want to spread my germs at all, so I ended up with 16 beautiful cupcakes and nobody to share them with! Cupcake with a side of flu, anyone? Yeah, I didn’t think so. So instead, I ate these cupcakes while watching the latest episode of This Is Us all by my lonesome. Anyone else out there cry every single time watching this show, without fail?? Or is that just me? Anyway, back to the cupcakes! I’ve been obsessed with cranberry desserts this season, and this post is no exception! The inspiration for these cranberry and white chocolate cupcakes came from one of the desserts I made for my family for Thanksgiving. I baked this absolutely delicious cranberry curd tart with a gingersnap crust by The View From Great Island. We all loved it and I definitely had second helpings, even after a big Thanksgiving meal. ‘Tis the season, right? After making the tart, I was feeling inspired to use cranberry curd as a cupcake filling. And I thought white chocolate cupcakes seemed like a perfect, festive choice. They are a good match for cranberry curd, which has just the right amount of tartness to help balance out the sweetness of the cupcakes themselves (there’s melted white chocolate in the batter AND the buttercream – yay!). If you’ve never had cranberry curd, it’s sweet, and tart, and buttery, and it tastes amazing. But most strikingly, I seriously can’t get over how gorgeous the color of it is! Seriously, it’s one of the prettiest things I think I’ve ever made. In order to get a smooth and beautiful looking curd, I’d recommend a couple tools: a good food processor for pureeing the cranberry sauce, and a metal sieve to extract any larger cranberry pieces from the puree. For pureeing, I love my versatile Ninja Kitchen System, which has both a blender attachment and a food processor attachment. It gets almost daily use in my kitchen! And for straining the puree, any medium-size fine mesh sieve should work just fine – I have this set ! The cranberry curd is a beautiful little surprise hidden inside each cupcake, but I wanted to dress up the outside a bit too. 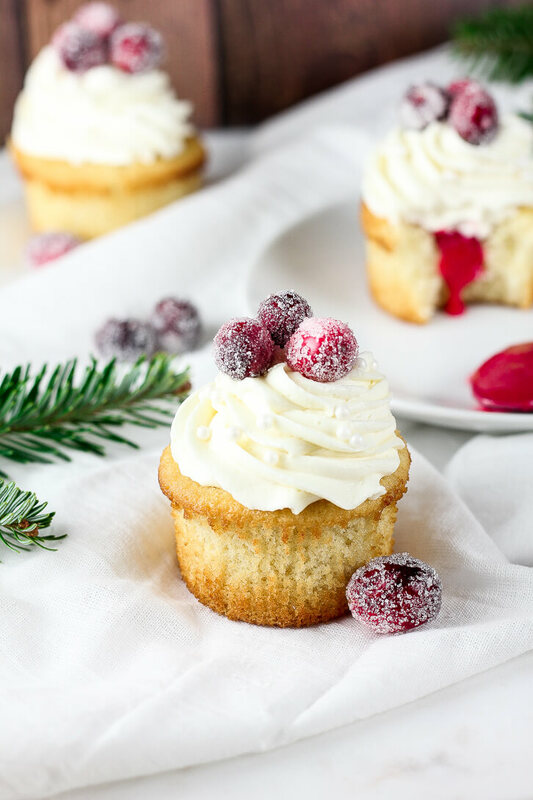 To decorate, I simply sprinkled each cupcake some white sugar pearls and then topped it with a few sugared cranberries – the directions for the cranberries are included in the recipe as well! Hopefully, you’ll have the opportunity to share these cupcakes as part of your holiday festivities. Though, if you end up with a whole batch to yourself like I did, I don’t think you’ll complain! 😉 Either way, I’d love to see your creations! Tag @flourcoveredapron on Instagram to share! Heat water and 1/4 cup of the sugar over medium heat in a small saucepan. Stir occasionally until sugar is dissolved. Remove from heat and add cranberries. Stir gently until they are coated in the syrup mixture. Using a slotted spoon, carefully transfer cranberries to a wire rack with a baking sheet underneath. Let dry for about an hour. Place 1/2 cup sugar in a shallow bowl and roll cranberries a few at a time in the sugar until coated. Return to wire rack to dry. Place cranberries, water, and 1/2 cup of the sugar in a small saucepan. Bring to a boil, then reduce heat and simmer for about 10 minutes or so, until cranberries have popped and the mixture has reduced and thickened (it will look like cranberry sauce). Pour cranberry sauce into a food processor and puree until smooth. then, press the puree through a sieve to discard of any larger pieces of skin, seeds, etc. Whisk in the softened butter until smooth, then return to the saucepan. Add egg, egg yolk, lemon juice, and salt. Whisk and cook over low heat until mixture thickens and coats the back of a spoon. Let the mixture cool slightly, then pour into a glass bowl. Cover the surface of the curd with plastic wrap and chill while you make the cupcakes. Preheat oven to 375 degrees Fahrenheit and prepare a cupcake tin with paper liners. This recipe makes about 16 cupcakes. Using an electric mixer, cream together the butter and sugar in a large bowl for about 4 minutes. Add eggs one at a time, mixing to combine after each addition. Then, add melted white chocolate and vanilla. With the mixer on low speed, alternate adding 1/3 of the flour mixture and 1/2 of the milk, starting and ending with the flour and mixing until incorporated after each addition. You will have three additions of flour and two additions of milk. Evenly divide the batter among the cups in the cupcake tin. Fill each one about 2/3 of the way full. Bake at 375 degrees Fahrenheit for about 9 minutes, until the tops have risen. Then, reduce heat to 350 degrees and bake for another 5-7 minutes. Let cupcakes cool in pan for 5 minutes, then transfer to a wire rack. Using an electric mixer, beat butter until light and fluffy. Add powdered sugar gradually, with the mixer on low speed. Then, add white chocolate, salt, and vanilla extract. Beat until combined. Add heavy cream 1 tablespoon at a time and beat until smooth. To fill the cupcakes, cut a cone-shaped piece out of the center of each cupcake using a small paring knife. Start by cutting a circle on the top surface of each cupcake about 1 inch in diameter. Then, slice about 3/4 of the way towards the bottom of the cupcake all the way around the circle, while also angling the knife towards the center (in the shape of a cone). The point of the cone will be pointing downward. Remove the core from the cupcake and set aside. Spoon cranberry curd into the center of the cupcake. Trim the cone-shaped core so that only the circular piece from the very top of the cupcake remains (about 1/4 of an inch thick). Replace this piece on top of the curd as a "lid" over the filling. Frost as desired with the white chocolate buttercream. Sprinkle with the sugar pearls and top with sugared cranberries. *Since the cranberries require some drying time, starting making them first, then continue with the rest of the recipe while you wait for them to dry. These are such beautiful cupcakes! I love the cranberries on top! Thank you so much, Neta. 🙂 I’m so glad you enjoyed! Sounds delicious! I’m going to try making it as a layer cake. With the curd, would you suggest maybe putting down a thin layer of buttercream first so it doesn’t leak into the bottom layer? Hi Aubrey! That sounds good – I’d love to hear how it turns out. I didn’t experience much “bleed” in the cupcake version with this curd, so you may be okay without it if you don’t need the cake to sit around too long before being served. That being said, if you’re concerned, it wouldn’t be a bad idea as long as you’re careful. I find that doing a layer of buttercream under another soft filling can be a little slippery, so aim for a slightly firmer buttercream and make sure you put a nice dam of buttercream around the edge of each layer. These cupcakes are absolutely beautiful. Making me wish I could just eat them right off the screen. Yum! Also, with the upcoming holiday parties, these would be perfect as a hostess gift.